Looking for dumpster rental pricing and sizing information ? Staying local and building business partnerships locally, helps our LOCAL economy grow. Let us show you why our roll off container company will outperform in every way possible. We protect your home from our dumpsters! All of our dumpsters are placed on boards in the rear and front of the container. This ensures that at no time the dumpster will not be touching your property. Ensuring a damage free service! Dumpster Delivery and Pick Up Notification! Our team of experts will ensure that the best communication is kept throughout your experience with us. We will text or call to notify you that our dumpster is under way or getting picked up. We are very easy to reach, anytime! 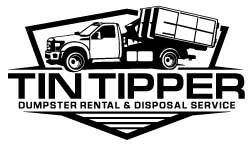 In many cases, Tin Tipper : Dumpster Rental is able to deliver a dumpster to your residential or commercial property on the very same day! Thousands of customers throughout the area have entrusted us with there bin rental needs. You should too!